The most modest of the independent estimates works out to $3,800 per vehicle, even after the fuel savings are taken into account. So whose predictions were more accurate? Although we don’t know how prices would have changed if regulations had been left alone, there are several trends that all moved together before the law was changed in 2007. The price index for vehicles (adjusted for quality improvements), published by the Bureau of Economic Analysis, had been falling steadily since the 1990s. The prices of other large consumer goods—“Furnishings and durable household equipment”—had been falling even longer, as modern manufacturing and trade made things like dishwashers and sofas cheaper. 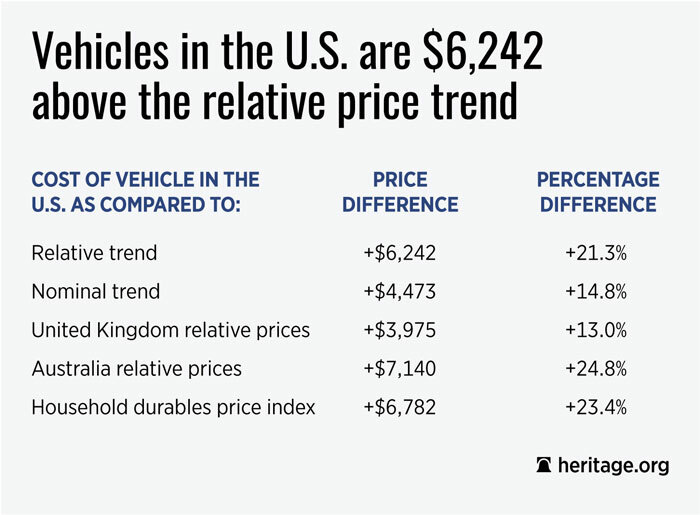 Prices for vehicles had been falling at about the same rate in the U.K., Australia, and Canada. So what happened? Several of these trends showed turbulence during the 2008-2009 global crisis, but then resumed their downward paths. The exceptions were car prices in the U.S. and Canada, which enacted similar new, more stringent, fuel economy standards. Will American Workers Get to Help in Rebuilding Puerto Rico?